For the past 50 years a select group of scientists has provided advice to the US President, mostly out of the public eye, on issues ranging from the deployment of weapons to the launching of rockets to the moon to the use of stem cells to cure disease. The role of the presidential science adviser came under increasing scrutiny during the administration of George W. Bush, which was highly criticized by many for its use (and some say, misuse) of science. This edited volume includes, for the first time, the reflections of the presidential science advisers from Donald Hornig who served under Lyndon B. Johnson, to John Marburger, the previous science advisor, on their roles within both government and the scientific community. It provides an intimate glimpse into the inner workings of the White House, as well as the political realities of providing advice on scientific matters to the presidential of the United States. The reflections of the advisers are supplemented with critical analysis of the role of the science adviser by several well-recognized science policy practitioners and experts. 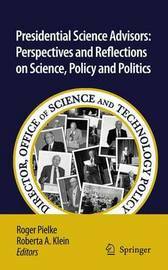 This volume will be of interest to science policy and presidential history scholars and students.